Marwan is a man who stared death in the face. They are so very far from home. When we first met Marwan and his family, we listened. That’s where empowerment—the slow, steady work of helping refugees get back on their feet—begins. Refugees know better than we do what they need to rebuild. When we listened to Marwan and his loved ones, we learned that tending sheep is in their blood. It’s part of their heritage. And now, it’s the path to a better future. 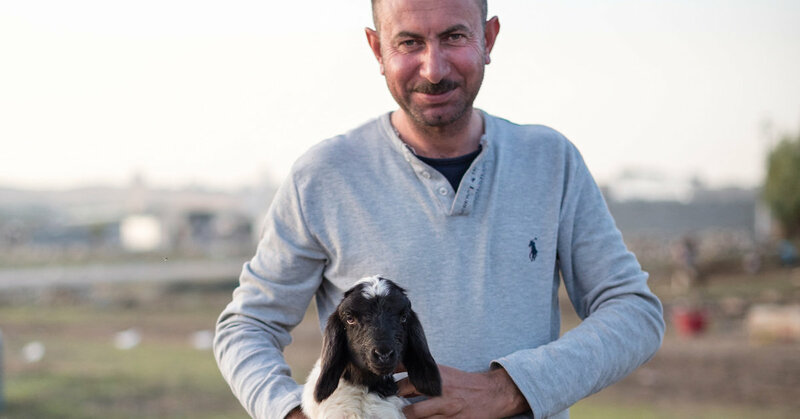 The sheep provided income for Marwan’s family, nutritious yogurt and cheese for his children, and a welcome distraction from the seemingly endless hardships of refugee life. But the road to empowerment is not always easy or straight, especially when you’re far from home. Winter took a heavy toll on Marwan’s sheep. A fatal virus began spreading through the flock. The family sacrificed $300 of their meager savings to pay for medicine. They lost a lot—but they never lost hope that this struggling, tenacious little flock was the path to a better future. We stood with Marwan in the field outside his home-far-away-from-home, watching as tears welled in his eyes. They were not tears of weakness. After all, this is a man who stared down ISIS. They were tears of sacrifice and uncertainty. They were tears of determination. He had not come this far, only to lose everything again. In the end, Marwan’s determination paid off. He was able to guide much his flock safely through the course of the disease. Today his sheep are healthy, and their number growing again—more than 100 graze in the fields nearby! Marwan’s family banded together with other displaced families and used the money they’ve earned to build a shelter where their sheep can keep warm and dry this winter, reducing their risk of disease. Marwan and his fellow refugees are survivors, fighters—and shepherds. Through their flock, new hope is being born in part of the world nearly overrun by death. This Christmas, empower a family with the gift of sheep—a vital source of income and nutrition for refugees who lost everything to war. Give now!